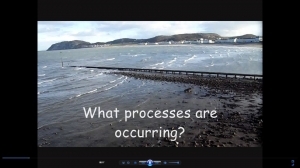 This movie introduces the topic of coastlines at KS4 level by looking at a variety of issues that pupils will study. To enlarge the movie click on the tab in the bottom right hand corner. 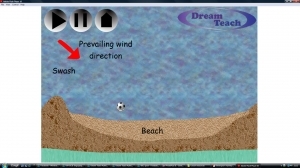 This presentation shows the effect of fetch on the UK coastline. This presentation highlights the difference between constructive and destructive waves. 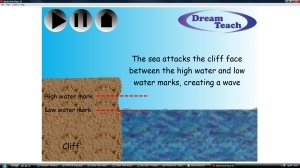 This presentation demonstrates the four main types of coastal erosion, showing how they operate on a coastline. 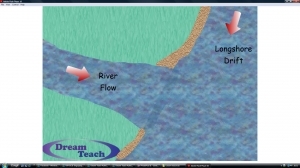 This animation highlights the influence of longshore drift upon a coastline. 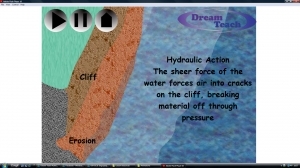 This animation demonstrates the formation of bays and headlands, in situations where rock and wave type allows it to happen. 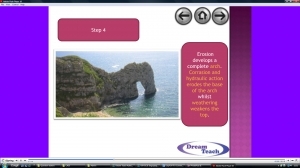 This presentation demonstrates the formation of caves, arches, stacks and stumps. It includes a modified photo deomstrating the chain of events, in addition to an animation. This is a stand alone animation that can easily be used to demonstrate the formation of these features. This animation highlights the development of wave cut notches, and how this can lead to a wave cut platform. This presentation demonstrates the formation of spits. It includes a modified photo outlining the formation and examples of notable UK spits. 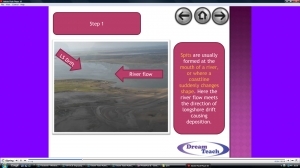 This is a standalone animation demonstrating the formation of spits at a coastline. This presentation focusses on the effect of mass movement upon a coastline, and how this can affect people and their property. It uses the Holbeck Hall hotel as a casestudy. 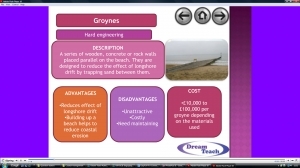 This presentation looks at the way in which people manage coastlines. It focusses on different methods of coastal protection in addition to other management strategies. 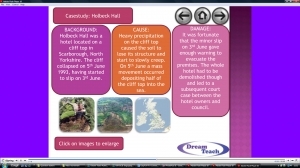 This worksheet looks at the impact of coastal defence on Swanage. It looks at the reasons for it, problems associated with it and other issues using maps and images. There is a Swanage Google Earth tour and an interactive activities resource to accompany..